Home / Blog / Seoul, South Korea, Shut down the illegal dog meat farms, slaughterhouses and markets. In Seoul, there are countless dog farms, slaughterhouses, markets and restaurants where the dogs, who are tortured their entire lives, end up being slaughtered in the most inhumane ways, such as by electrocution, hanging or beating; and then thrown into boiling water – sometimes while they are still alive. In many places, dogs are being killed in full view of other terrified, caged dogs; and this takes place in broad daylight. In addition, many abandoned and stolen former pets end up in this industry, and are subjected to the same cruelty. Two search results on Naver (the most popular search engine in Korea) – the first one was for so-called “Health Food Shops” which commonly sell dog elixirs and cat elixirs (also known as dog soju and cat soju); and the second one was for “dog meat restaurants”: 929 Health Food Shops; and 574 restaurants in and around Seoul. Please sign petition, call, write and email the Seoul Mayor and the City Council TODAY! [Update: January 4, 2019] Click HERE to see the Seoul’s response. Dont your country have any form or way to solve this problem. This is sick nonsense the dogs are raised in fear and die suffering. Such a sick country you guys are. I will never by Samsung or any products or ever have any respect for your country. Sick bastards. Your people deserve to be tortured and killed. See how G-d responds. He will erase tortorer and replace sinners with moral and ethic humans. Therefore you once be on their place to pay your bill. I wish to natural disaster on them 3 weeks ago and it actually happened. That’s not the only time I’ve wished natural disasters on countries that are totally cruel to animals. Dubai was another one. They had an earthquake. Keep pushing s*** on these people and it’s bound to happen God’s not going to put up with this any longer they have been doing this for thousands of years. He put these animals and all this Beauty on this Earth for us to enjoy not to make it suffer. I have had it with those subhuman species and they are demons. Yellow skin slant-eyed demons. For the most part anything that comes out of that side of the world are demonic. I agree in all points! Schande über das Land Süd Korea – es sind keine Menschen, die hilflosen Mitgeschöpfen Gottes solche unsäglichen Leiden und Schmerzen zufügen – es sind Bastarde, Monster und Bestien in Menschengestalt. Pfui Süd Korea – Eine Schande für die gesamte Menschheit! Totaler Boykott aller Waren und des Landes selbst! MANY Koreans are very much opposed to the dog & cat meat trade. There are many Korean activists, who risk their lives to save animals. Let’s honour them. Oh Lord please have mercy on the terrible suffering endured by your creatures. May there be swift and severe punishment meted out to those involved. May Koreans learn to be merciful to all animals who feel pain and terror just as much as we do. Cruel people, you are disgusting the way you treat animals, no respect for other beings. I hope that if there is a God you will suffer in hell. it is morally unacceptable for South Korea to support the enormous suffering of dogs and cats that are brutally killed, have no good living conditions. The only solution is for the government to take responsibility for it and take steps to stop such cruelty. 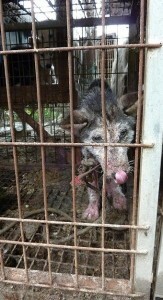 You are a sick, disgusting, ignorant people….NEVER again will I purchase ANYTHING made in Korea. You should all hang your heads in shame — better yet, hang the subhumans who ar involved with this suffering, and also the people who eat these poor creatures. If there is a God, I would be worried if I were you! What you do to His animals is not going to please Him. What will happen to you when you leave the earth? He is watching you- respect and care for His creatures! We need to unite together internationally and exterminate each and everyone of these ugly,slant eye, filthbag asian dog and cat murderers! Dogs and cats are pets. Don’t you have a heart? Take a minute and just look at them….it’s heartbreaking what you do to them. It’s not enough to be humans; you must be humane. I hope the korean people realize that this sickness will result in its own terrible karma for the perpetrators of this horrendous cruelty. We have to stop cruelty. DOGS ARE BY NATURE LOVING, GENTLE, AND KIND CREATURES. THEY HAVE FEELINGS AND EMOTIONS, AND THEY SUFFER GREATLY WHEN MISTREATED BY HUMANS. — ALL FORMS OF CRUELTY TO ANIMALS MUST BE STOPPED, AND ALL THE PERPETRATORS OF SUCH MUST BE BROUGHT TO FULL JUSTICE! — ALL ANIMALS WERE PLACED HERE ON EARTH BY A WISE AND LOVING CREATOR TO BE COMPANIONS FOR HUMANS. THEY ARE TO BE CARED FOR AND PROTECTED. ALL ANIMALS WANT TO GIVE AND RECEIVE LOVE FROM HUMANS, WHICH IS NATURAL FOR THEM. — THE HIDEOUS, INHUMAN, STUPID, DESPICABLE, SENSELESS, CRUEL, HEARTLESS, INSANE, SAVAGE, MANIAC MORONS THAT INTENTIONALLY MISTREAT, BEAT, TORTURE, INJURE, AND/OR SLAUGHTER INNOCENT HELPLESS DOGS ARE DESERVING OF THE HARSHEST AND SEVEREST PUNISHMENT FOR THEIR WICKED CRIMES. THEIR ACTS TOWARD INNOCENT POOR DOGS ARE TOTALLY HORRIFIC, BRUTAL, CALLOUS, REVOLTING, BARBARIC, AND EVIL! THE EATING OF DOGS IS EXTREMELY DECADENT, SAVAGE, BESTIAL, INHUMAN, AND CRUDE. THESE PEOPLE’S CHARACTERS ARE EVIDENCE OF THE DEMONIC MONSTERS THEY ARE. — ALL THOSE GUILTY OF DOING SUCH ATROCIOUS THINGS MUST BE FOUND AND CAUGHT, AND SEVERE PUNISHMENT MUST BE SERVED UPON THEM IN RETRIBUTION FOR WHAT THESE POOR DOGS HAVE SUFFERED, AND ALSO TO INSURE THAT NOT ONLY THEIRS BUT POTENTIONALLY ANY OTHERS HEINOUS CRUEL ACTS TOWARD INNOCENT ANIMALS BE PERMANENTLY ENDED! SUCH PEOPLE’S VIOLENT AND SADISTIC NATURES CLEARLY SHOWS THAT THEY ARE A DETRIMENT AND A POTENTIAL DANGER TO CIVILIZED SOCIETY! THEIR PUNISHMENT MUST BE WIDELY PUBLICIZED AS A DETERRENT TO ANY OTHERS WHO MIGHT BE CONSIDERING DOING THE SAME. — STRICT LAWS MUST BE IMPLEMENTED AND ENFORCED TO INSURE THAT SUCH ATROCITIES WILL NEVER OCCUR AGAIN! — LASTLY, A WELL ORGANIZED EFFORT MUST BE EMPLOYED TO INSURE THAT ALL SUCH DOGS THAT SUCCUMB TO THIS FATE ARE RESCUED, LOVINGLY AND TENDERLY TREATED FOR ANY INJURIES THEY MAY HAVE INCURRED, AND KEPT IN A LOVING ENVIRONMENT WHERE THEY WILL BE PROPERLY CARED FOR. End the brutality of your so-called ‘culture’ NOW! This is horrendous. The whole planet knows that dogs/cats are man’s best friends. These loving animals are the inspiration for people to become vegans. So please don’t come with the pathetic “cultural difference” excuse. A country that enjoys the torture of dogs/cats simply accepts cruelty to all animals as normal. We want the extreme opposite. Using people’s love for dogs/cats to stop eating all animals and go vegan. 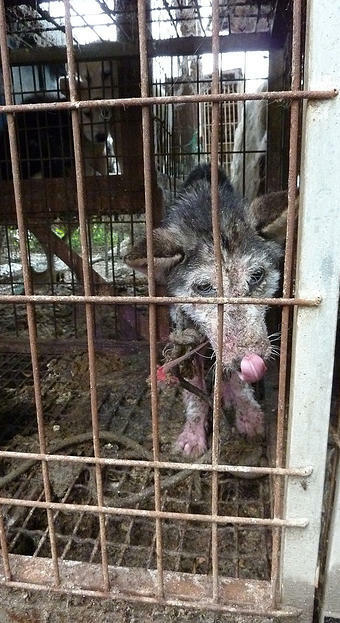 Please stop your shameful atrocities, South Korea. I am boycotting your companies (Samsung, Hyundai, LG, Kia Motors) until you ban it forever. Writing to you from Brazil, with disgust !! Stop the dog and cat comsuption ! Stop this cruel and disgusting practice! Stop the killing and change to humanity! Save poor vats and dogs, please! They’re so cute animals! Please stop this inhumane treatment of Dogs. They are so loyal to their owners, and they are extremely intelligent animals. Stop this brutal killing! You dont need this! Think! Please stop this cruelty on innocent dogs, best friends of humans. Stop this horrible cruelty now! Stop this cruel practise NOW! i have left messages with seoul municipal government, seoul council and the governor. millions worldwide are boycotting. we will never stop shouting and fighting for justice for these dogs and cats. This haunts me everyday. What is wrong with these people. Please stop this!